I knew from the outset that this plenary by Phil Baran from the Scripps Research Institute wasn’t going to be an easy one to sit through given its organic nature. The hour seemed like a never-ending series of line drawings of unfamiliar compounds and reactions, which went on and on, slide after slide. Although I really enjoyed CHEM204 Biological and Organic Chemistry this year, this presentation really did nothing for me. In contrast, Kieran was on the edge of his seat, hanging on every word it seemed, given he himself is an organic chemist. The next plenary by Katharina Landfester from the Max Planck Institute for Polymer Research in Germany had a little bit more to offer me. Her research involves polymeric nanocapsules which are designed by a process called mini-emulsion. Some really cool applications were discussed, from drug delivery mechanisms to photon energy conversion. 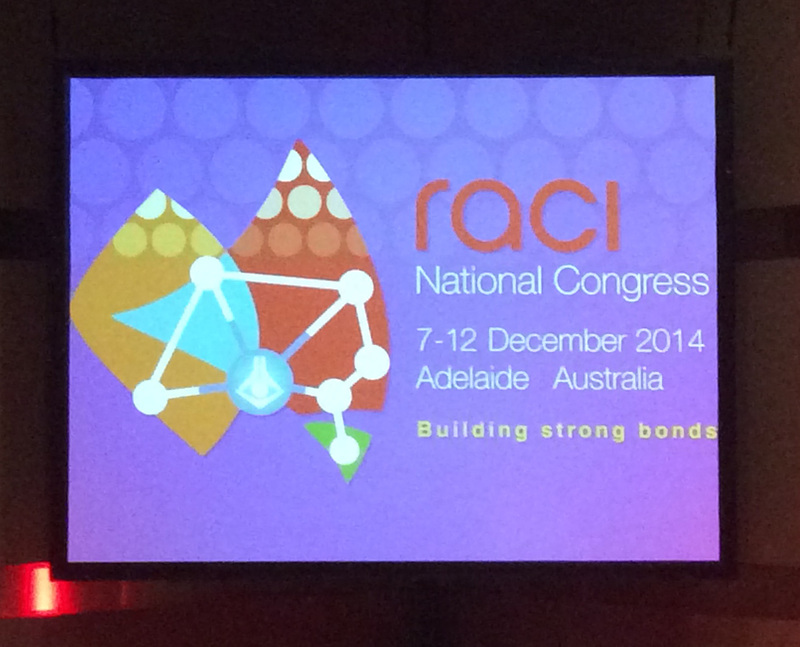 This talk was probably “the talk” that defined RACI14 for me. Joachim Heberle from the Freie University in Berlin presented work on the light-gated ion channel, channelrhodopsin, which set set the stage for the rapidly evolving field of optogenetics. In optogenetics, targeted illumination or light modulation is used to control the functions of cells expressing light-activated proteins. Essentially, an organism that expresses channelrhodopsin is shown to have increased neural activity when a blue light is shone upon it. This research has important implications for neurodegenerative diseases and other mental illnesses so naturally, I was on the edge of my seat while Joachim showed us the following YouTube clip. 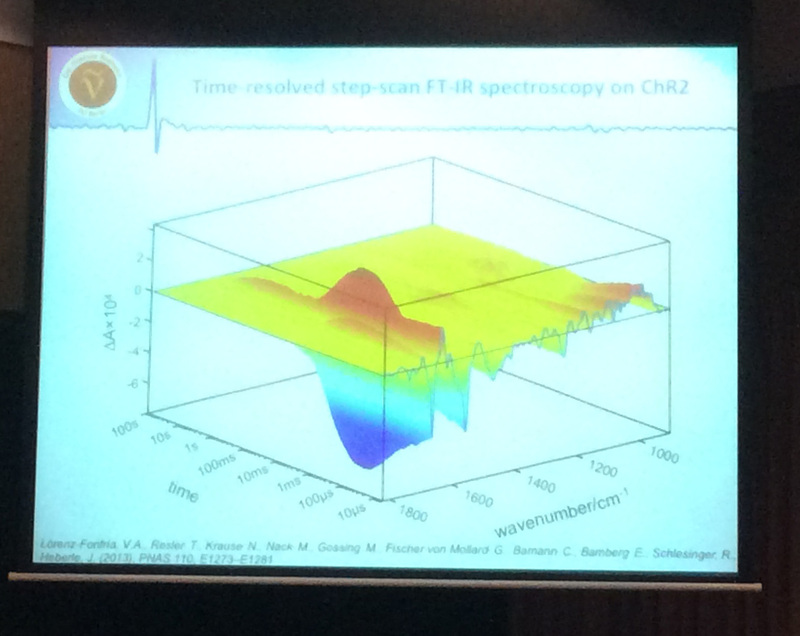 His work also focused on time-resolved spectroscopy, which basically adds a third dimension (time) to standard IR spectroscopy to produce output similar to the image below. Pretty cool I thought! I have since contacted Joachim by email (as we didn’t get a chance to chat after his presentation) to enquire about his work and to let him know about my research into photoactivatable adenylate cyclases (PAC), which has similar properties to channelrhodopsin. Surprisingly, he too is working on PACs and has promised to send me a paper on it once it is published! Apparently, they are currently writing the “manuscript”. 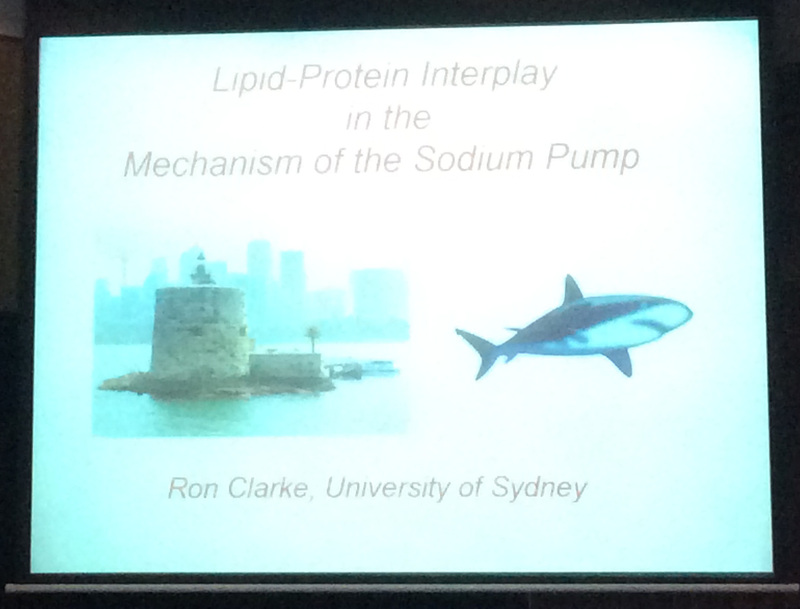 This talk by Ronald Clarke from the University of Sydney not only appealed to me due the lipid-protein connection, but also because at the beginning of his presentation he promoted the Australian Society for Biophysics (ASB), the co-organiser of the Interdisciplinary Chemistry session. Further, there was going to be a conference next year in December at my own alma mater, the University of New England in Armidale. It turns out Pierre Moens, a Senior Lecturer at UNE, is the President of ASB. I guess I know where I’ll be next December! But back to Ron’s presentation, it was about the rapid changes in transmembrane electrical potential that occurs via voltage-dependent Na+– and K+-channels in muscle and nerve cells. I found this topic particularly relevant to my own research since electrical signals responsible for neural activity are carried by a chain of molecular relays powered by sodium ions, and “pumps” in the axon membrane transport sodium ions around, charging the membrane just like you would charge a battery. Then a series of voltage-gated channel proteins uses the charged membrane to send a message down the axon. If the membrane is charged, the channel stays closed but if the voltage across the membrane drops, the channel opens up. This allows it to send the nerve message. Ron’s research focused on the response of a voltage-sensitive fluorescent protein (RH421) with benzyltriethylammonium (BTEA) which binds from the extracellular medium to sodium pump’s transport sites.